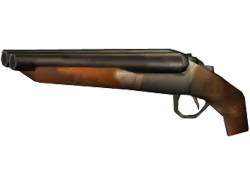 The Sawn-off Shotgun in GTA San Andreas. The Sawn-off Shotgun, also known as the Sawed-off Shotgun, is a weapon available in Grand Theft Auto: San Andreas, The Lost and Damned and Grand Theft Auto V. This gun is based on the Remington Spartan 100 with a shorter gun barrel and often a shorter or deleted stock. Compared to a standard shotgun, the sawed-off has a shorter effective range, but the more destructive power because of increased pellet velocity and wider spread cone means more collateral power. Its reduced size makes it easier to maneuver and conceal. Such a powerful and compact weapon is especially suitable for use in small spaces, such as by vehicle crews, and entry teams running through doorways. To make shotguns less concealable, many jurisdictions have a minimum legal length for shotgun barrels. Despite being a shotgun, it is held like a pistol; the player can even sprint while holding it. It is double barreled and can only fire two shells before a rather lengthy reload. At hitman level, the player can dual wield it and fire four shells instead. With hitman skill and unlimited ammo, the sawn-off shotgun is almost as powerful as a rocket launcher, as it will blow up a car with about six shells and a helicopter with about 24. The sawn-off shotgun can now be used while riding motorcycles (not driving cars) to perform drive-bys. It only holds two shells per reload and a short effective range, but it is very powerful. It is exclusive to The Lost and Damned and cannot be found in Grand Theft Auto IV, nor in The Ballad of Gay Tony. The sawn-off shotgun is so powerful at close ranges, it becomes very impractical and suicidal to hit people with cars or attempt drive-bys during multiplayer matches, especially if the auto-aim is turned on. While on a motorcycle, this can be used to instantly set a vehicle on fire by shooting the rear tires. This weapon is usually a 1 hit kill, but sometimes takes 2 hits. The sawn-off shotgun appears now as a shortened pump-action shotgun. Just like in TLAD, it can only be used for drive-bys on bikes and buses. Given to the player at the beginning of the game. Can be bought at Terry Thorpe's gun van. Available at the player's safehouses after completing 10 Gang Wars. Call Jim and ask for one. At the porch of an old wooden house, western Grand Senora Desert. Behind the police station at Vespucci Canals, going upstairs. San Chianski Mountain Range - on the ground next to a rail cabin. The Sawed off shotgun in The Lost and Damned was based on the Remington Spartan. As its name implies, the sawn-off shotgun is usually produced by home-made modification of a standard shotgun. In countries where handguns and pistol ammunition are rare due to legal restrictions or high price, criminals are known to convert legal or stolen hunting weapons into concealable weapons. The Lost and Damned's rendition features dual triggers and hammers (exposed). It is the first weapon used by Johnny Klebitz in The Lost and Damned. Oddly, if looked upon closely while firing the sawn-off shotgun, it ejects shells after every shot. This would not happen in real life, as the shotgun depicted in-game is a break action, and the shells would stay in the chamber and would need to be manually removed. In GTA San Andreas, if the Infinite Ammo cheat is enabled and the player's weapons statistics are at maximum, this weapon is more than capable of taking out any foe the player encounters, even more so as CJ can move while he shoots. The name "Sawn-Off Shotgun" is quite confusing. Because "Sawn-Off" or "Sawed-off" is a term to refer a shotgun which the barrel is shortened to increase the spread, even it is an automatic or pump action shotgun. Usually, Sawn-Off Shotguns with a break-open type are referred as "Lupara". † = Special and Collectors Edition exclusive. †† = Social Club member exclusive. ‡ = Add-on exclusive. ‡‡ = PS4, Xbox One, and PC exclusive. This page was last modified on 18 March 2014, at 16:25.